When you are about to watch a movie that is a spin-off of a sequel the expectations automatically dip a bit... but when the film is set in the world of the Conjuring franchise you might want to reconsider. 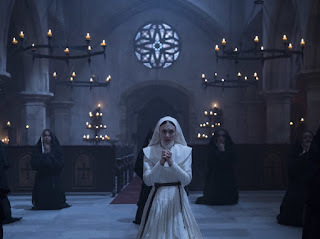 James Wan and his team of producers/writers/directors score another positive win with The Nun. While Conjuring 1 & 2 are pure throwback horror magic, and Annabelle/Annabelle: Creation were both quite serviceable. The Nun falls somewhere in between those four films... perfectly situated right there in the middle. A period piece set in 1952, the majority of the film takes place at a remote convent in Romania. Plenty of jump scres, good background story for the Conjuring Universe and great acting from Farmiga & Bechir make this one pretty fun. I will certainly watch it again when it is released at home and have no regrets about paying box office prices to see it! Great idea and very good review, Mr Mike D. You could put an image from the movie, the poster or something like that. I Think it will be cool. Mike, sorry bro. My browser didn't show the image of the movie that already was in the post :) Anyway: Great review!